10) Metallica Through the Never: I bought a used copy of “Some Kind of Monster” some years ago. I tried to watch it but, thankfully, the disc was scratched and I was saved from continuing to watch my musical idols whine and go to therapy. Unlike that, “Through the Never” is just an awesome concert film cut with real footage from live tours. If you’ve never been to a Metallica show this is the closest thing that you can come to, and the band looks heavier and meaner than ever! 9) 12 Years a Slave: Incredibly difficult to watch, but the most graphic and heartbreaking story of American Slavery I’ve ever seen on the screen. If you want to see everything hidden from the history books, watch this film. 8) Crystal Fairy: What do you get when Michael Cera has a little bit of time off and wants to do a movie about looking for psychedelic drugs? Evidently a brilliant hip and funny movie with a lot of heart! Indie cinema just for the love of making a movie, totally up my alley. 7) Evil Dead: Is it possible to remake a cult classic without ruining it? Hell yeah it is! Evil Dead is more brutal than the original intended to be. This is one of the very few horror films in recent memory that deserves the honor of being called a horror film. 6) Man of Steel: Although far from being able to compare to Richard Donner’s Classic, this is the first time anybody has been able to successfully bring back Superman to the big screen. Definitely a Superman for a new generation and, though not as good as the Dark Knight Trilogy, a great step into making us again believe that a man can fly. 5) Saving Mr. Banks: For the longest time I felt that Disney had lost all of its heart. Perhaps this will be the turning point symbolizing the great return of Disney films. Literally a Disney film about the making of a Disney film, “Mr. Banks” gives respect to the creation of art and makes you believe that the soul of Disney is good and living. 4) Blue Jasmine: Amazing Woody Allen film starring Cate Blanchett as a depressed fallen figure. Amazing performances by everyone who graces the screen on this one, and a testament to the fact that Woody Allen is one of the best directors of our time. 3) Dallas Buyers Club: Not only does it showcase a relatively unknown history that happened in my own hometown, but it brings perhaps the most amazing performances by anyone this year in the form of Jared Leto and Mathew McConaughey. 1) WHITE HOUSE DOWN: Total self indulgent film that makes you throw away any belief in reality and just takes you through a roller coaster of explosions, one liners, and more explosions. This was the only movie this whole year where you can really just go to have fun at the movies, learn nothing, probably come out dumber, but had a hell of a fun time sitting through. For more on White House Down, CLICK HERE!! Film Review: ‘Saving Mr. Banks’!! This entry was posted on Sunday, December 29th, 2013 at 11:18 pm	and is filed under Film. You can follow any responses to this entry through the RSS 2.0 feed. You can skip to the end and leave a response. Pinging is currently not allowed. 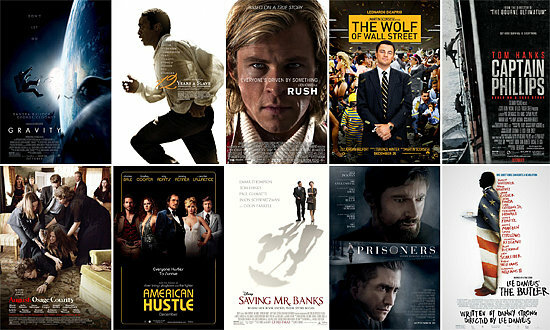 « Bryan’s Top 15 Movie List of 2013!!! [upon seeing Achilles' boat to land first on the beaches of Troy] The man wants to die!